Reprint. Originally published: New York: Random House, 2017. ONE OF BARACK OBAMA'S BEST BOOKS OF 2017Shortlisted for the Rathbones Folio Prize 2018An unforgettable cast of small-town characters copes with love and loss from the No. 1 New York Times bestselling and Man Booker long-listed author of My Name is Lucy Barton Recalling Olive Kitteridge in its richness, structure, and complexity, Anything Is Possible explores the whole range of human emotion through the intimate dramas of people struggling to understand themselves and others. Anything is Possible tells the story of the inhabitants of rural, dusty Amgash, Illinois, the hometown of Lucy Barton, a successful New York writer who finally returns, after seventeen years of absence, to visit the siblings she left behind. 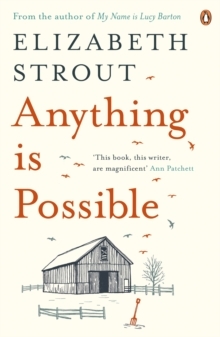 Reverberating with the deep bonds of family, and the hope that comes with reconciliation, Anything Is Possible again underscores Elizabeth Strout's place as one of America's most respected and cherished authors.